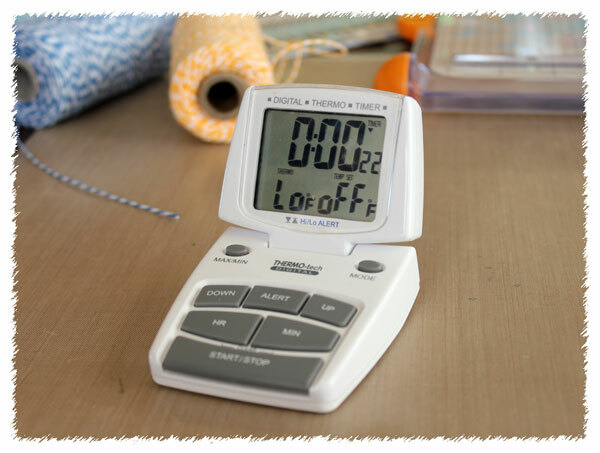 10 Minute Craft Dash - AKA Stress Moments! 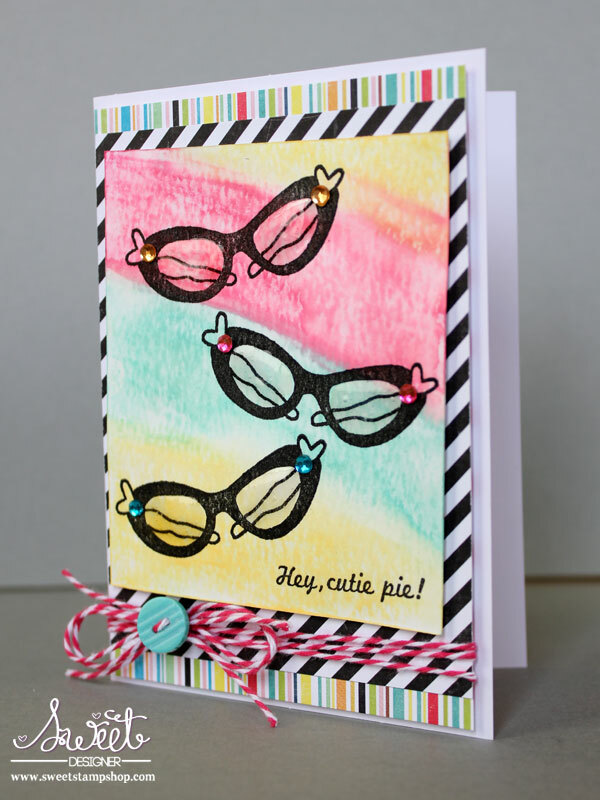 Now, I frequently make cards quickly, so when I saw this 10 Minute Craft Dash Challenge, I thought, "How hard can it be?" 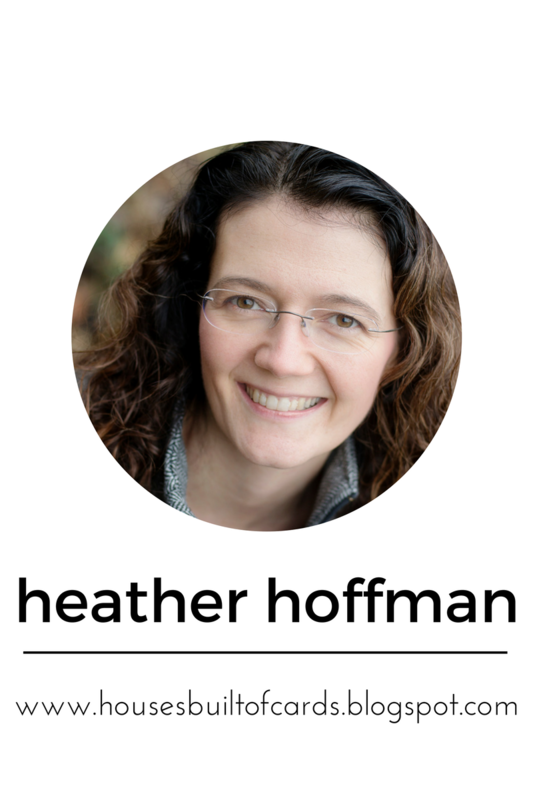 It helped to be able to gather my supplies first, and I had a plan, so I thought it would be no problem. Why then does the timer give such an adrenalin rush? Yikes! So...the details! 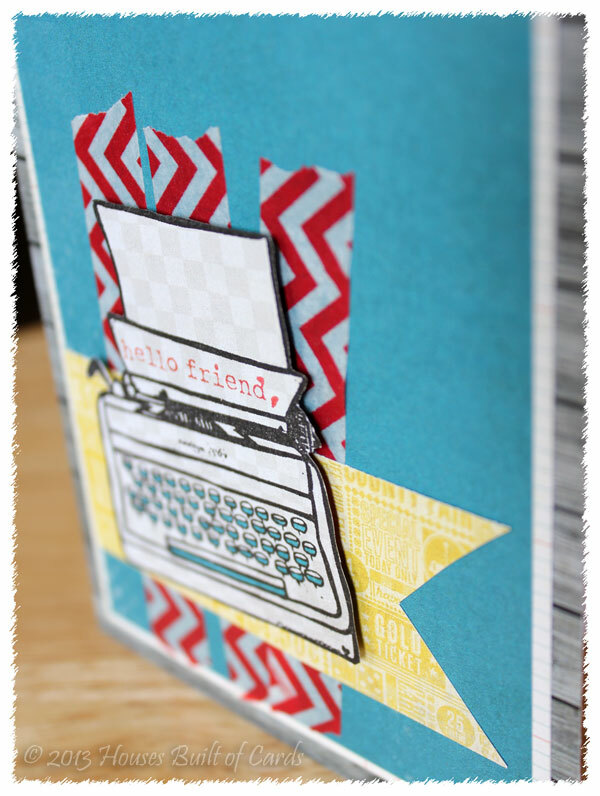 I started off with some American Crafts 6x6 papers (no idea which lines they are from!) and punched a lace border with a Martha Stewart Edge Punch, layered and stuck them together, then trimmed and matted in white. 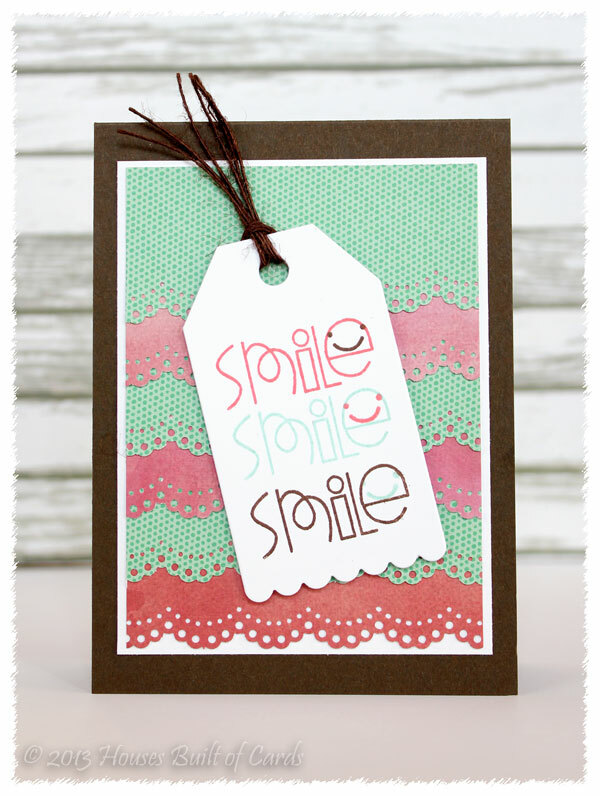 I cut the tag with one of the new Paper Smooches Dies, then stamped the sentiment from a Paper Smooches Set called Giddy Bugs in different PTI ink colors to coordinate. The little smiley face in each of the "e's" came from a set called Hullabaloo. 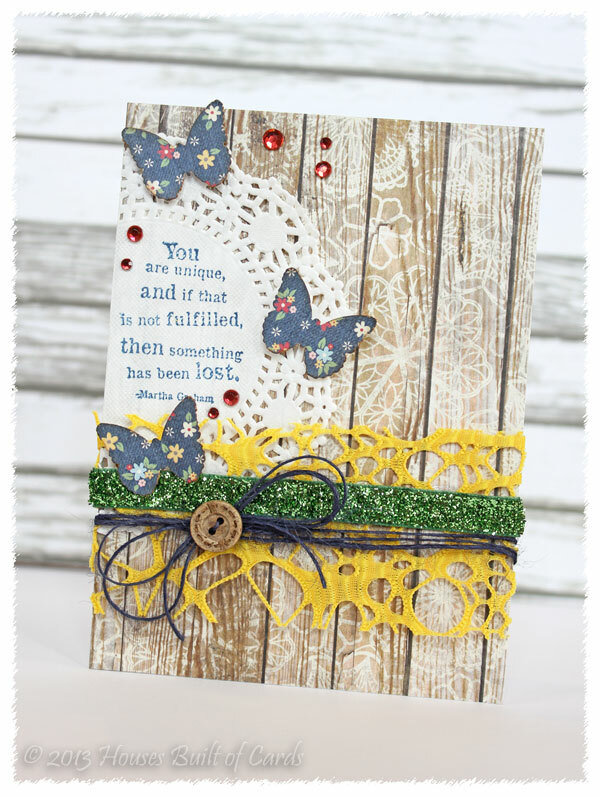 Mounted the lace border panel on my card base, added some jute twine to the top of the tag, then attached the tag with foam adhesive to my card base. 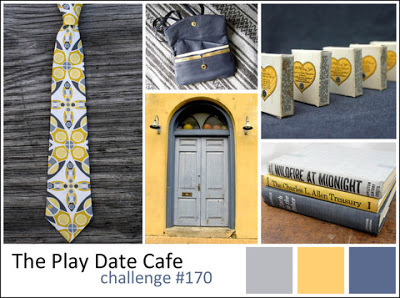 If you haven't a had a chance to play along - this is a totally fun challenge! I have had fun checking out all the entries! Have a great day!!! Good Afternoon! 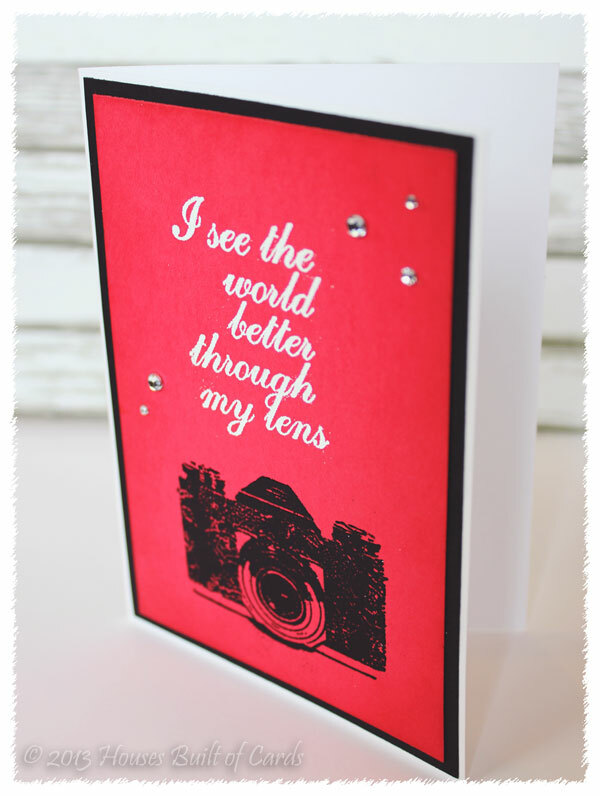 My daughter's were finally feeling a bit better today, so I took a few minutes to put together a card for the Moxie Fab World Camera Craze Challenge! 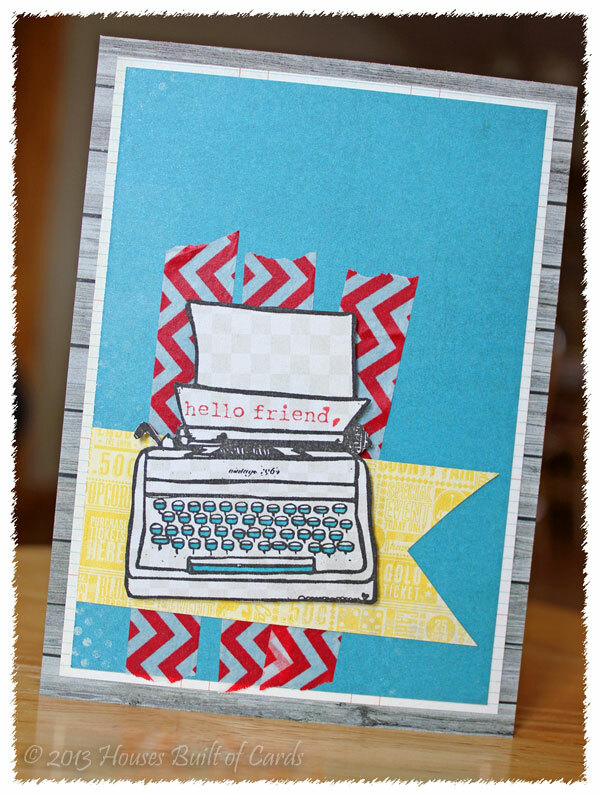 This is perfect to link up over with this weeks Simon Says Stamp Challenge - Anything Goes as well.. 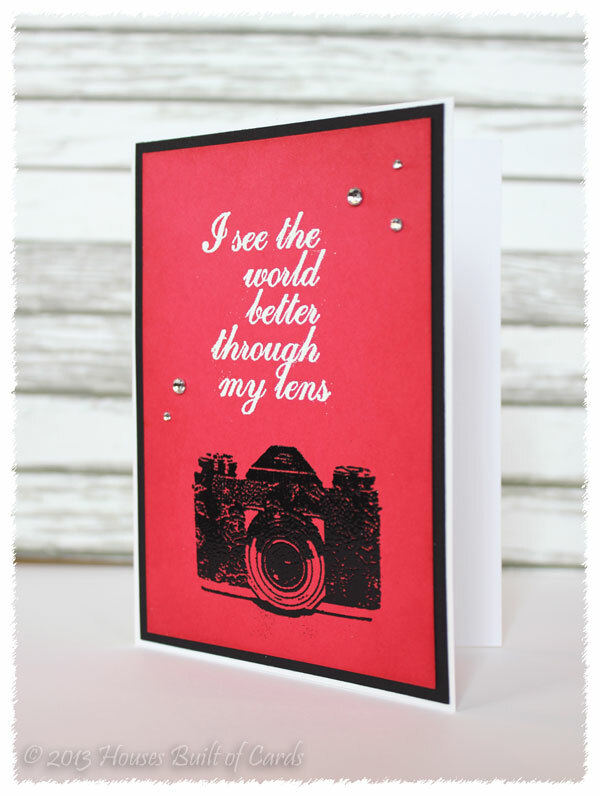 I also found a new way to stage my card photos - would LOVE to hear what you think! 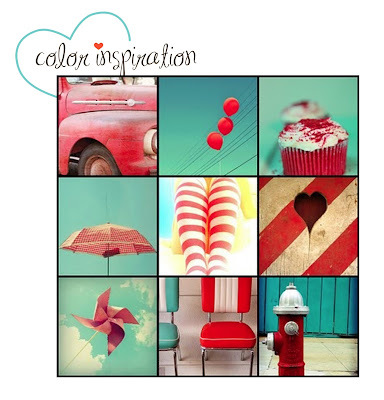 I LOVE all the inspiration that Cath posted on the challenge! 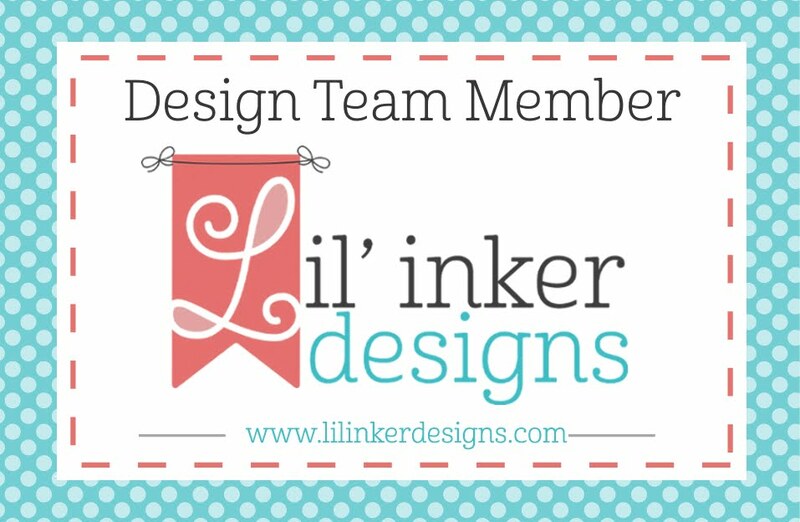 Who can HELP but be inspired?!?!?! 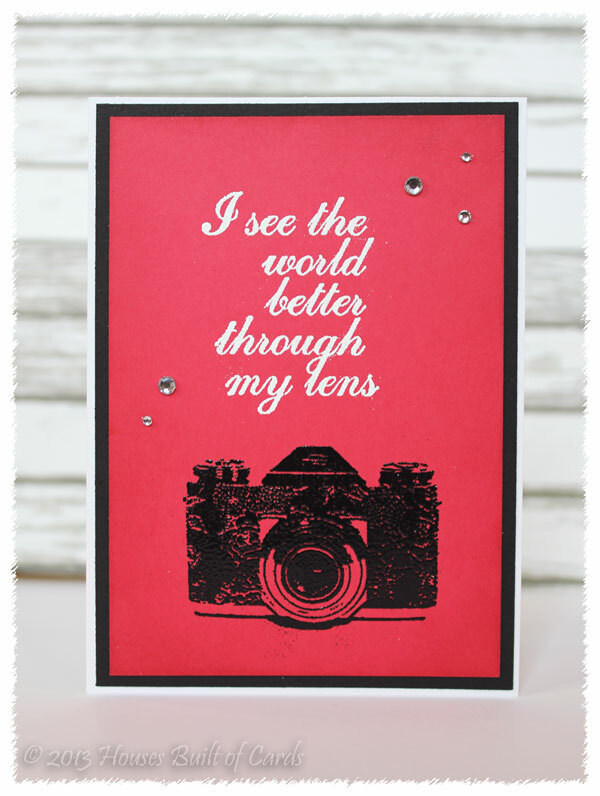 I started off with some Bazzil Cardshop in Pink, and stamped that lovely camera and sentiment from Unity Stamp Co, heat embossing in white and black. Inked the edges with distress ink, matted in black, then attached to a white card base. Finished off with just a bit of bling! 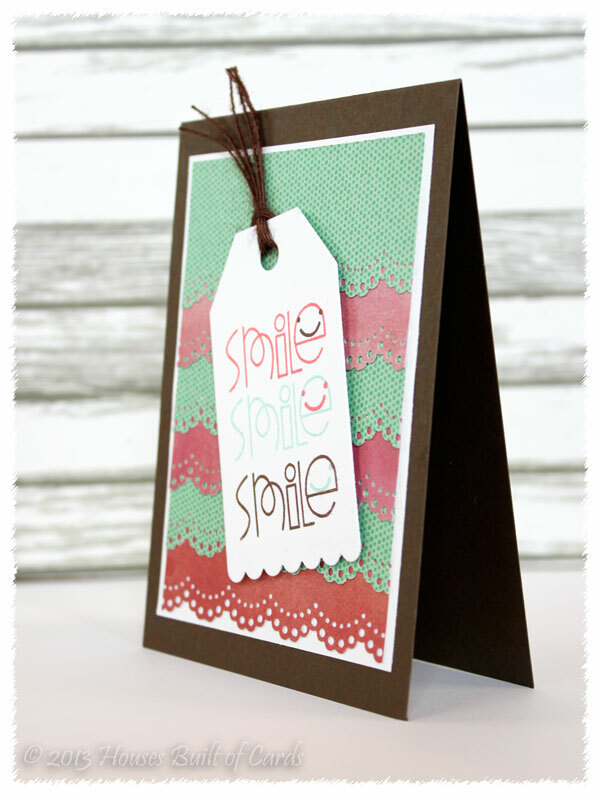 I am pretty sure there will be more cards for this challenge - if I can get them done! See you again soon! Runway Inspired Challenge - Textures! The colors, the textures, and the design elements all popped out at me, so I went with a bit of all of them. 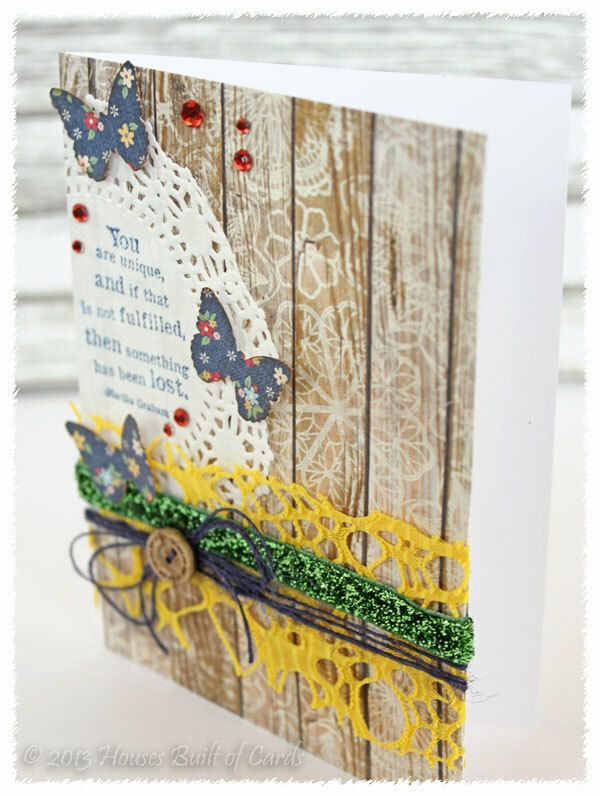 I used some yummy May Arts ribbon - thought the texture on the yellow was perfect, and LOVED the glitter ribbon run over the top! 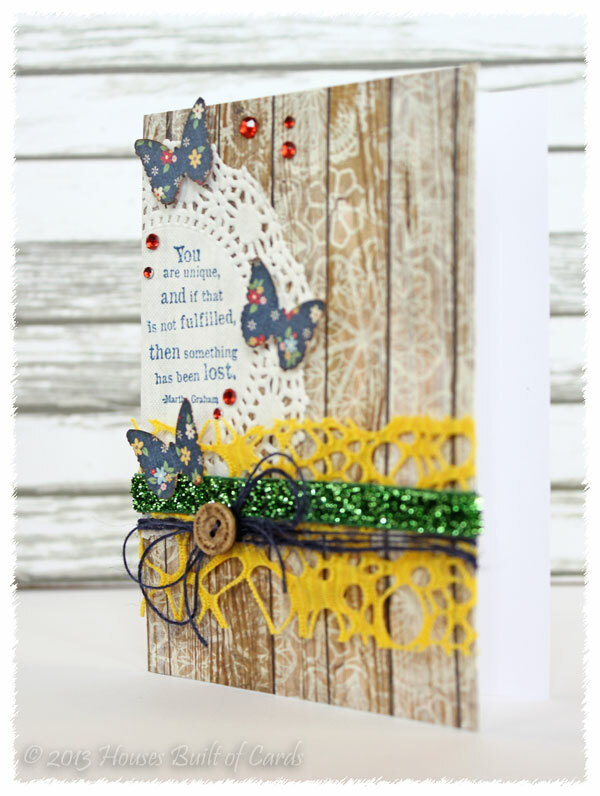 Jute twine, a nice rustic button, a doily, a Unity Stamp sentiment stamped with PTI ink, and some butterflies cut from Simple Stories paper - all layered on some pretty woodgrain/doily paper from My Mind's Eye. Hi there! I don't know about you - but I haven't had the greatest amount of time to craft lately. My oldest daughter had the flu last week...and of course, it was time for the second one to take over this week. So I am spending some time just being a mom right now! However, I did manage to sneak this in sometime between them both being sick...and since the challenge ends tonight, I thought I'd better get it posted! I kept it pretty simple. My pattern paper is from an older My Mind's Eye paper pad. 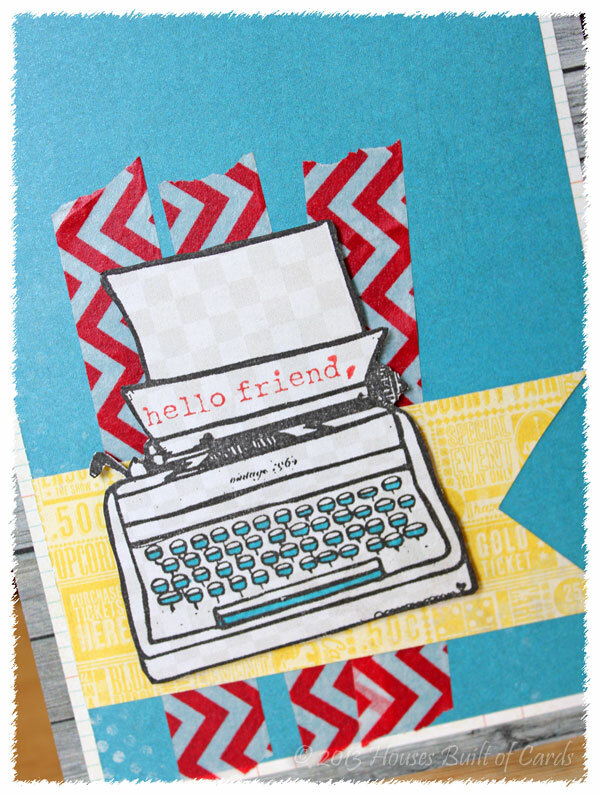 I used a Fiskar's Edge punch for the notebook edge, then stamped an image and sentiment from the Unity February KOTM. Inked the edges with Antique Linen distress ink. 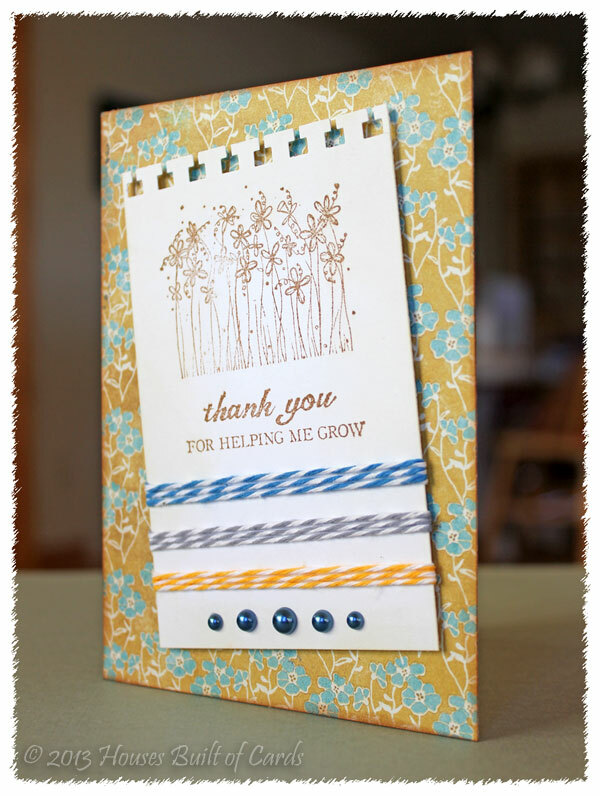 Wrapped some twine around (the Twinery just happens to be the sponsor this week! 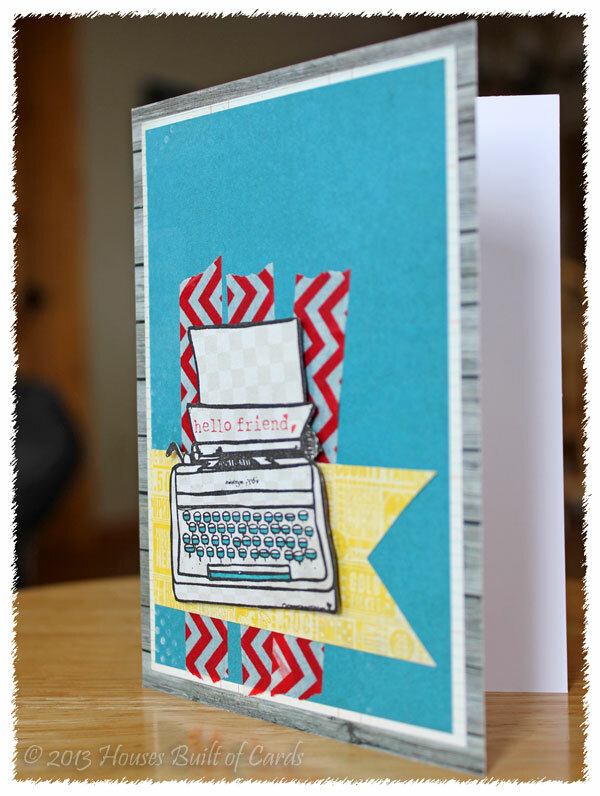 ), and attached with foam adhesive to the card base, which I inked with Vintage Photo distress ink. Thanks for stopping by! Hopefully my family is back to good health soon, and I can get some things caught up! Have a great night! So...wanna geek out with me? 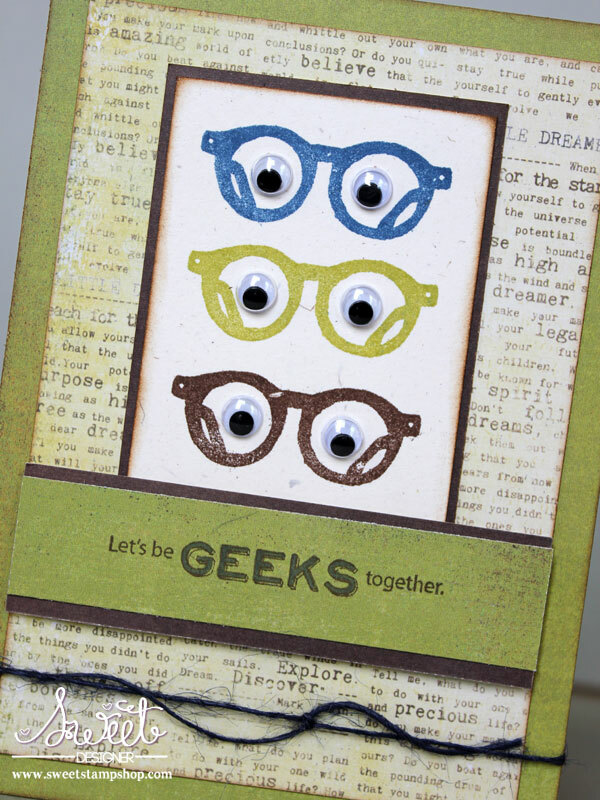 I made this card to be more of a guy card - used 3 different PTI inks to stamp them, then added some wiggly eyes in each pair of glasses. My pattern paper is from Basic Grey (green) and We R Memory Keepers (brown and words) - and all the edges are inked with Tim Holtz distress ink. 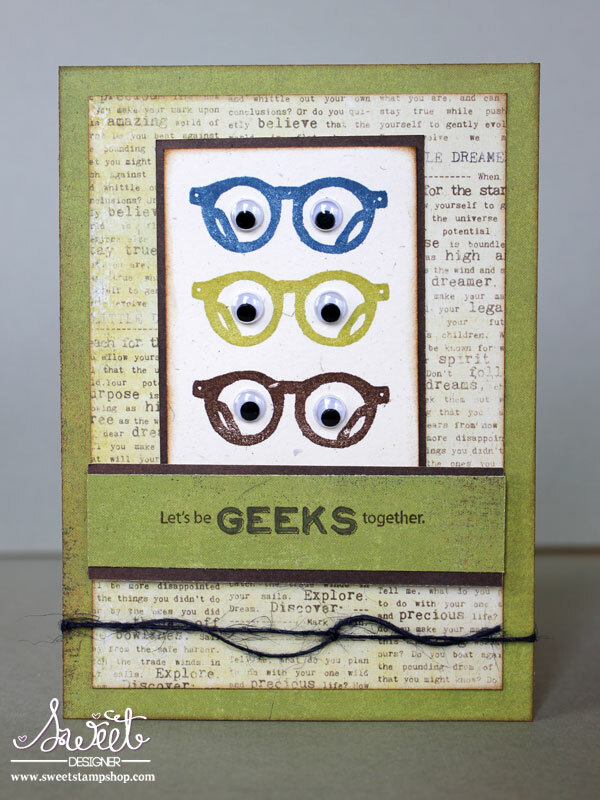 I stamped the sentiment, and colored in the word "geeks" with my Copic markers, then added a twist of blue jute twine on the bottom. 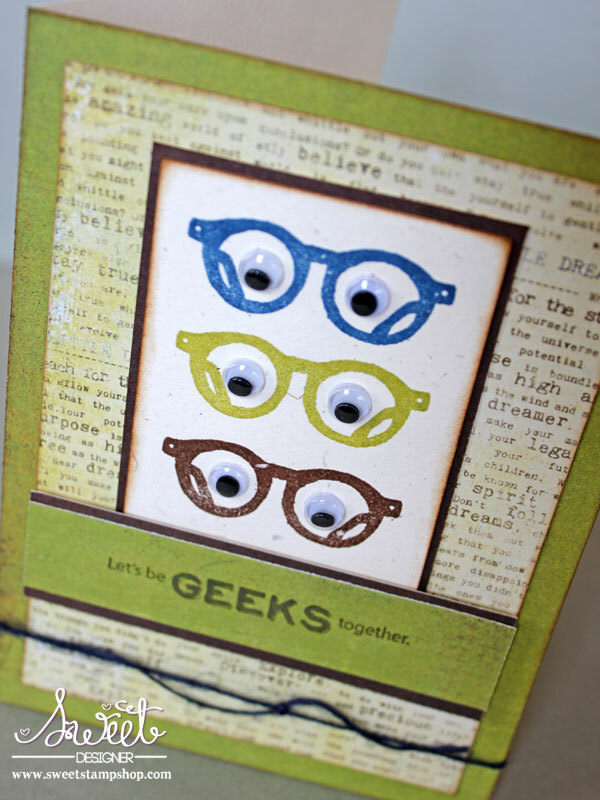 The next card uses the same set - but is decidedly feminine!!! For this one, I started off with some watercolor paper, rubbed 3 different PTI inkpads directly on the surface, then brushed over with a water brush to give the watercolor background effect. 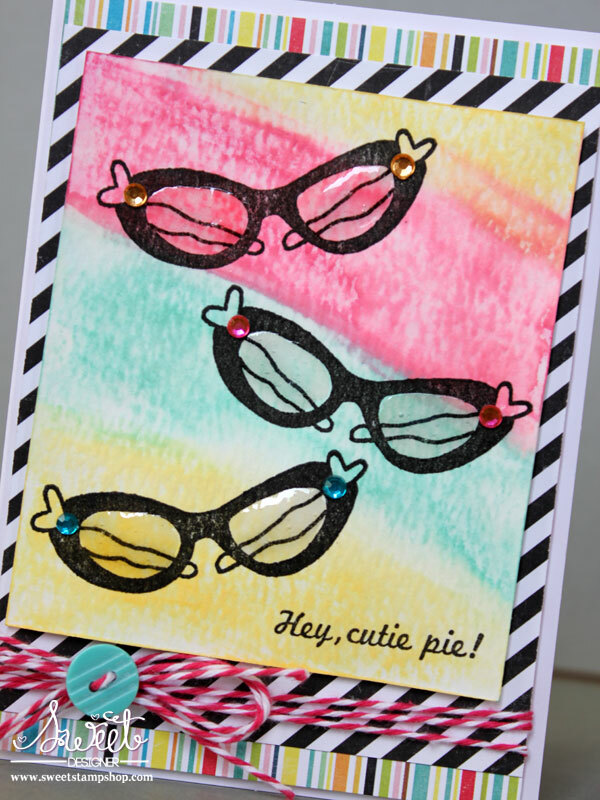 I let it dry very well, then stamped my glasses and sentiment on, added a bit of bling, and Glossy Accents on the glasses lenses - a little hard to see in the picture, but totally fun! 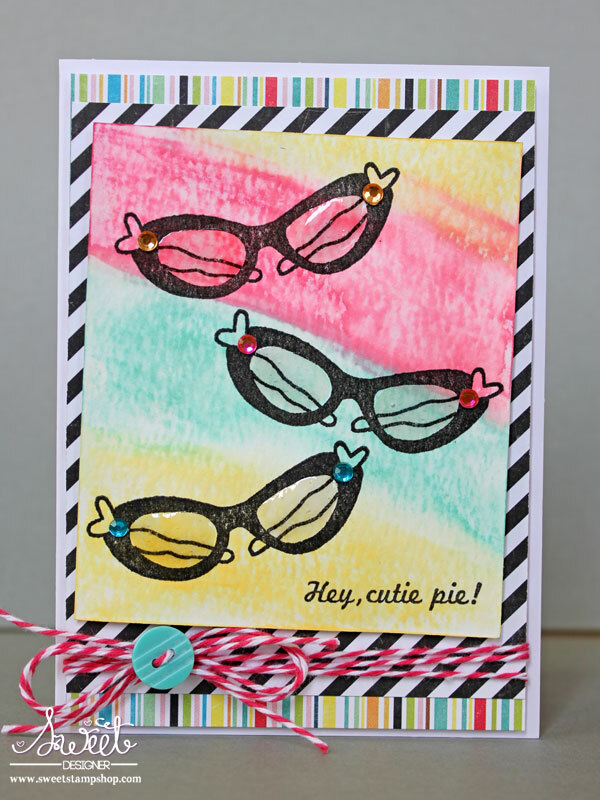 Added some fun Echo Park Happy Day collection papers - that went perfect with the retro feel of these glasses, and finished off with some Baker's Twine and an October Afternoon button. 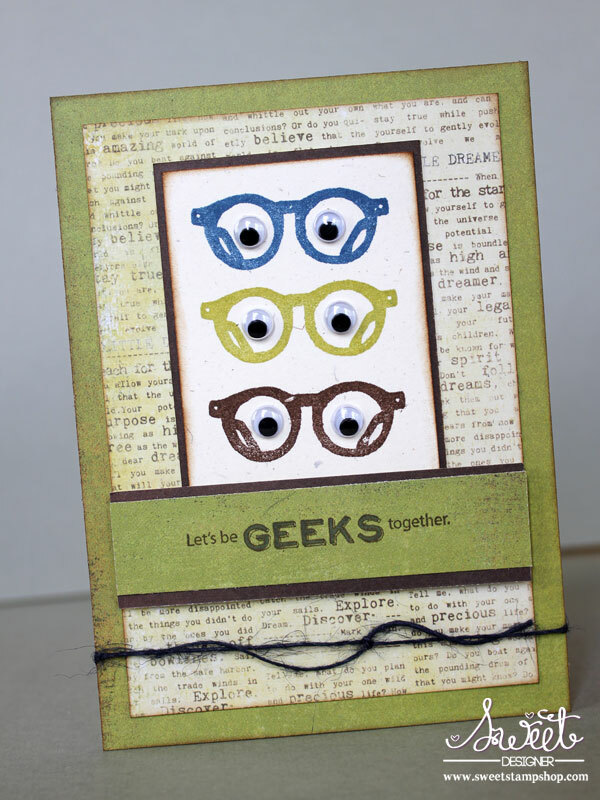 All the layers are assembled with foam adhesive - so this card is full of dimension! 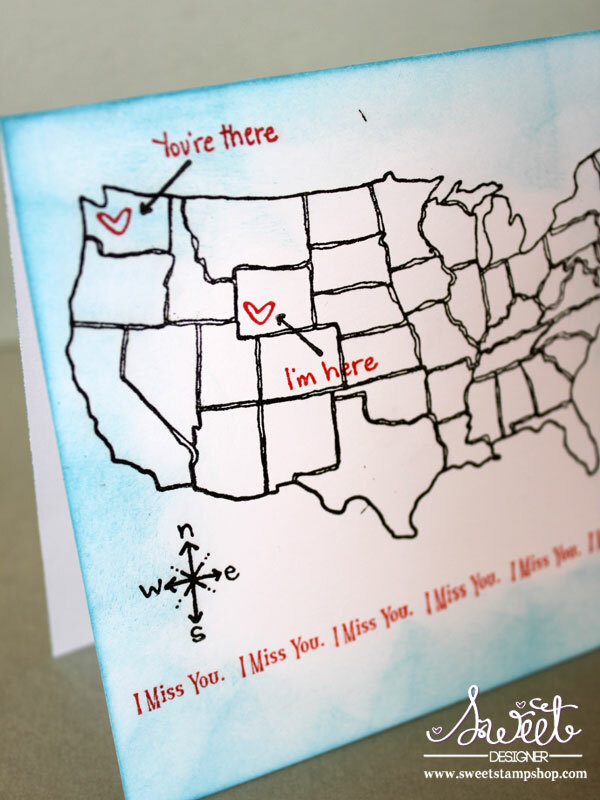 There is just something fun about a map stamp, don't you think? For this, I did the same watercolor background technique, rubbing 2 different PTI inkpads directly on some watercolor paper, then brushing over with a water brush and allowing to dry. 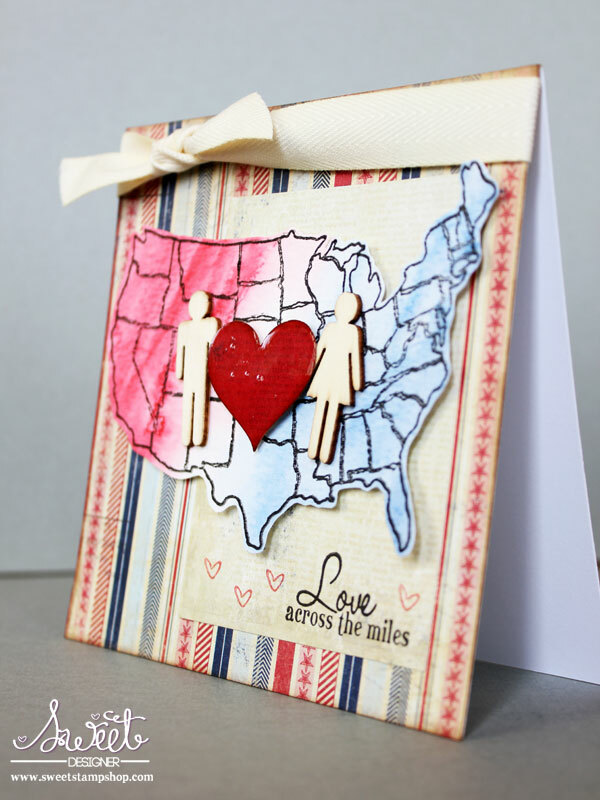 Then I stamped my map piece over the top and fussy cut it out. I layered some Authentique 6x6 papers for my card base, then stamped my sentiment and the tiny hearts from the kit on the bottom of one panel. 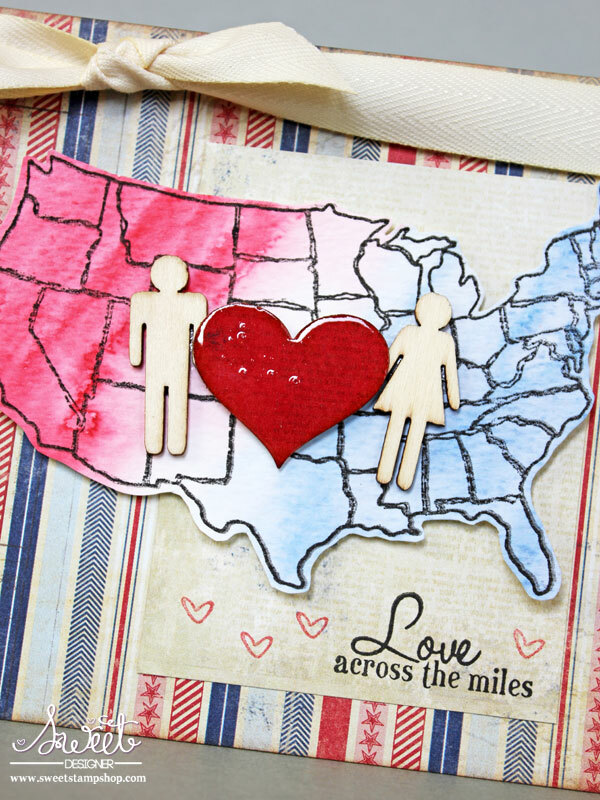 Next I attached my cut out US map with foam adhesive, and layered some Studio Calico wood veneer people, along with a heart cut with a Fiskar's punch and covered with Glossy Accents. Finished off with some twill ribbon on the top, and some inking with my distress inks around the edges. The next one with this set is totally clean and simple! 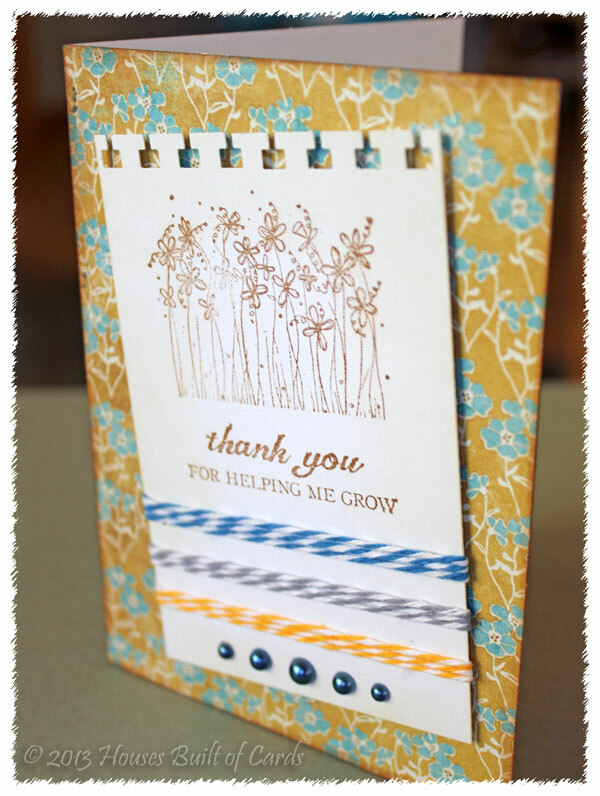 I love how it came out - and plan on making lots of these to keep on hand, since we just moved about 6 months ago from all our family and friends - I have a feeling I could use lots of these! 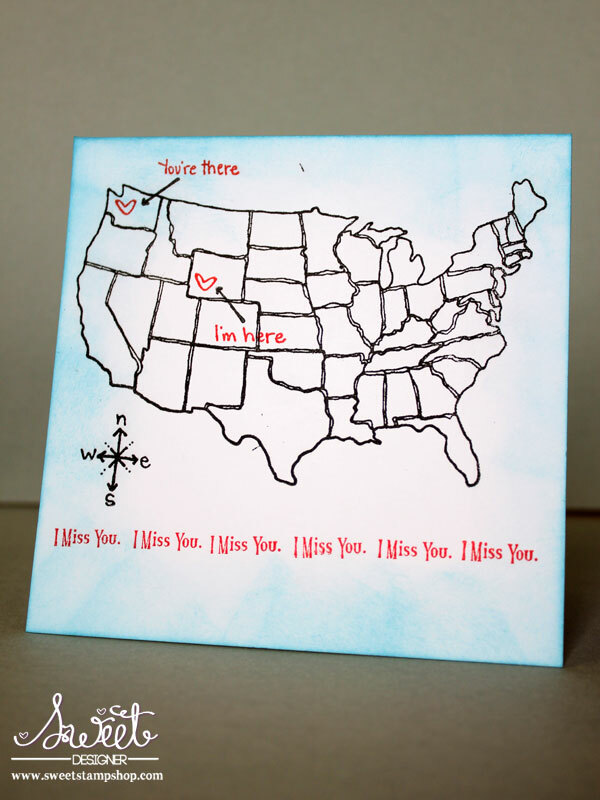 I used a simple white cardbase, stamped the map image with black Versafine ink (great coverage! 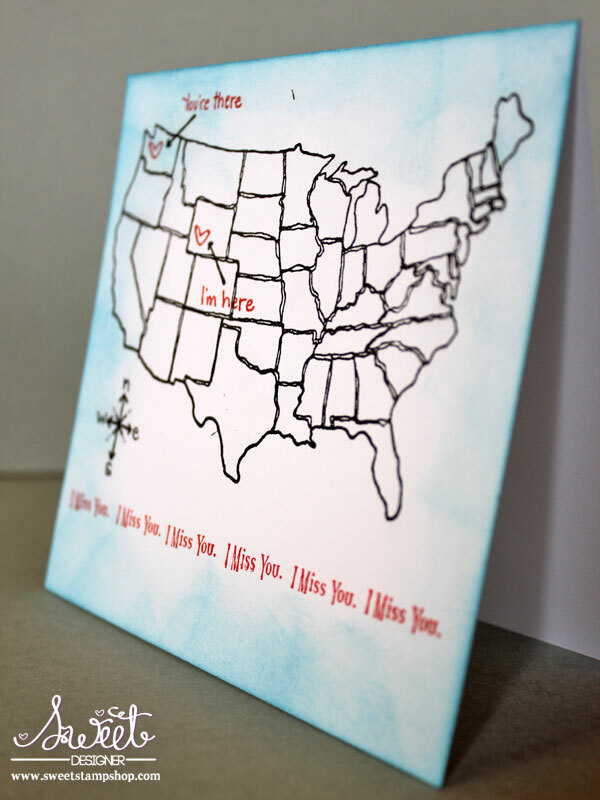 ), then added the hearts, arrows, "I'm here" and "You're there" sentiments - the red is distress ink in Barn Door. 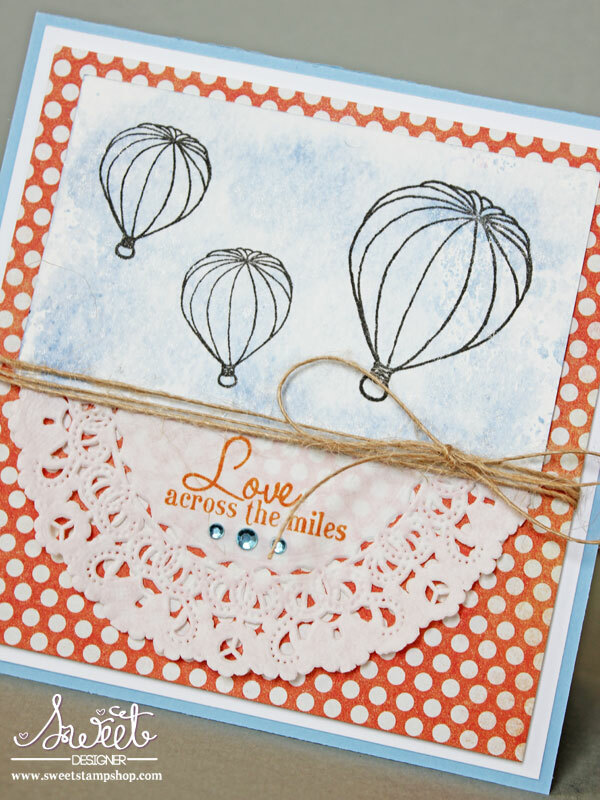 I also added the compass stamp image, and stamped "I Miss You" repeatedly across the bottom, also with distress ink. 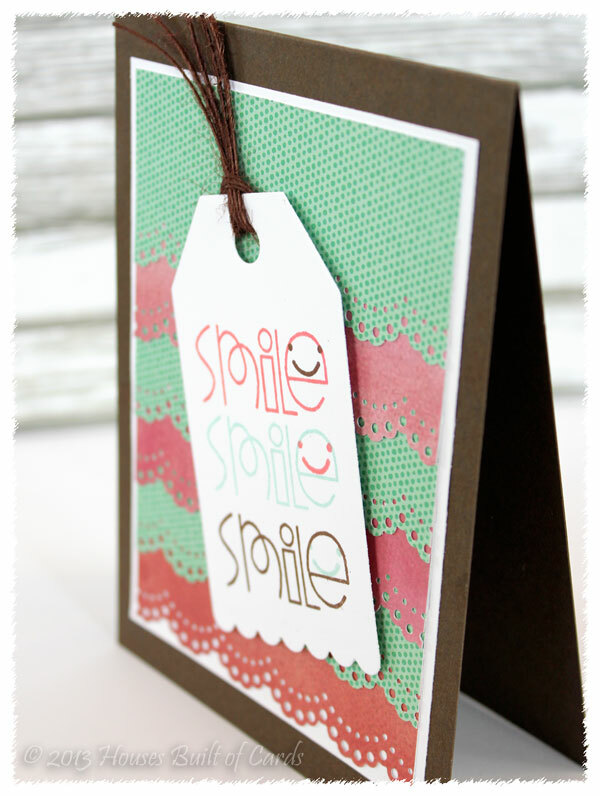 To finish it off, I sponged distress ink in Broken China around the edges - LOVE how simple it is, but how perfect and finished it made it! I had lots of fun making the background for this one. I rubbed some PTI ink on my nonstick mat in a large square, then sprayed on some Glimmer Mist. I then smooshed a piece of Watercolor paper right onto it, until it was well saturated. I let that dry (once again!) 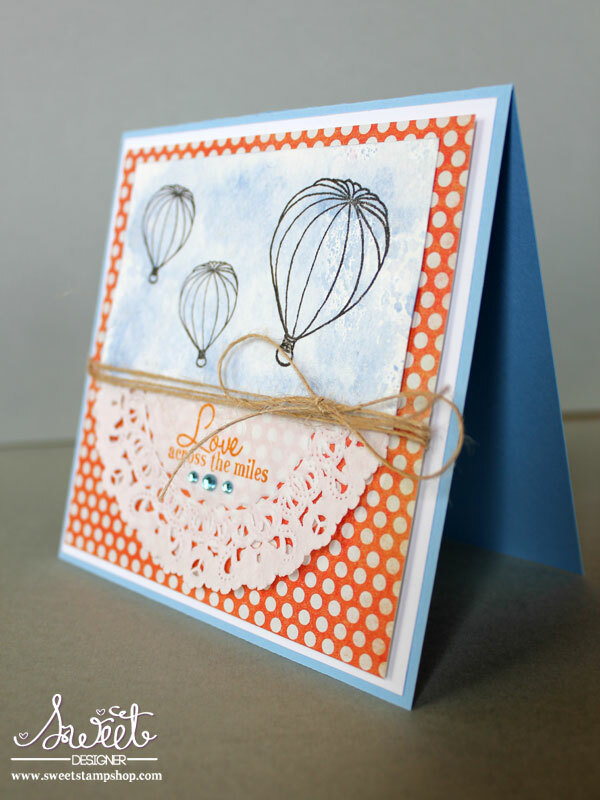 and then stamped my hot air balloons on top of it. I wish I could get the subtle sparkle to show better in the pictures - it is so soft and pretty! 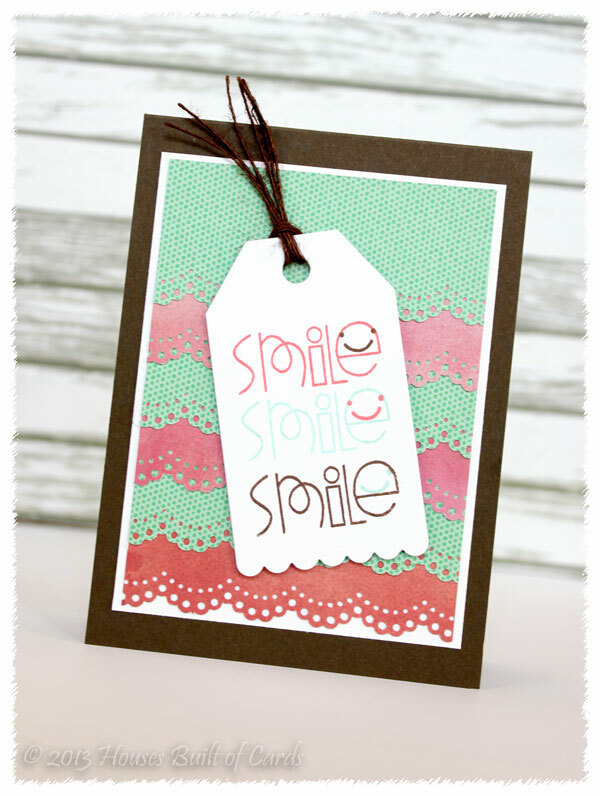 Tucked a doily under the watercolor paper, stamped the sentiment with some PTI ink, and tied around some jute twine to finish the whole thing off. Whew! Incredibly long post, I know! 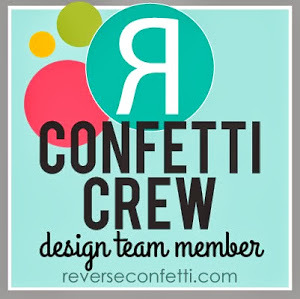 If you made it all the way to the bottom, I have a little something sweet that I would like to give away!!! 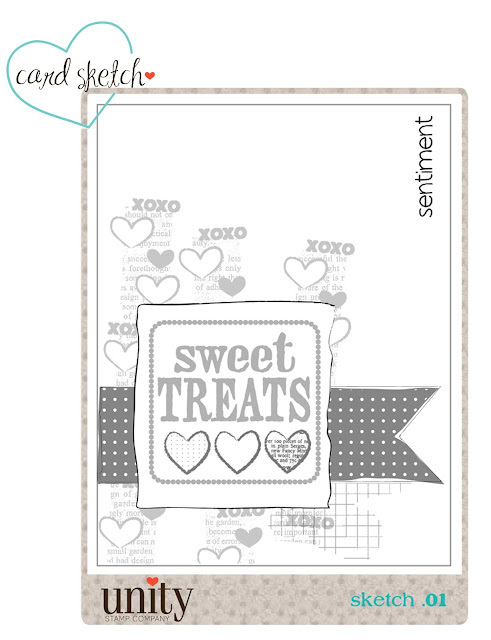 This sweet set called Sweet Tooth! Just leave a comment at the bottom, letting me know what's your favorite of the *many* cards above! Thanks for stopping by! Hope you have a fabulous day!!! And here is the color palette - yummy isn't it? Definitely so much to be inspired by here! I pulled out some older My Mind's Eye papers from my stash and went to work! 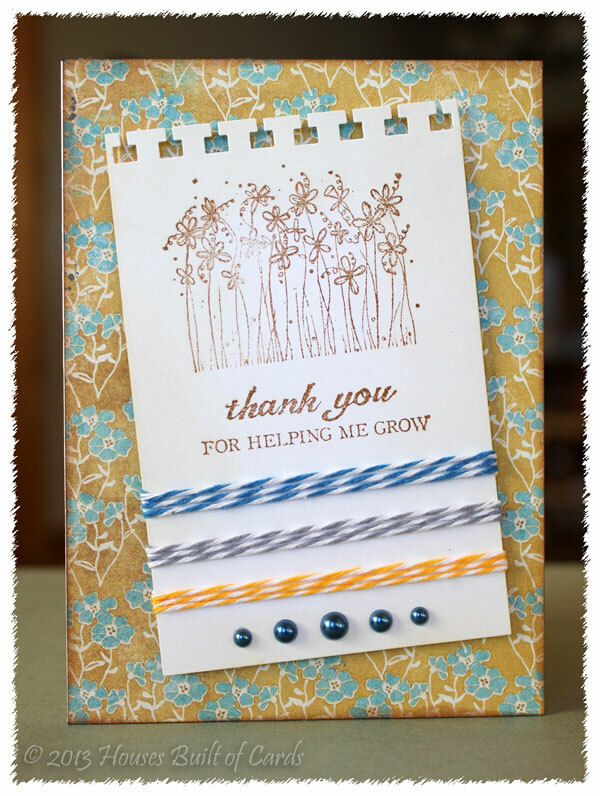 I layered some red chevron washi tape on the blue background, then added the yellow banner over the top. 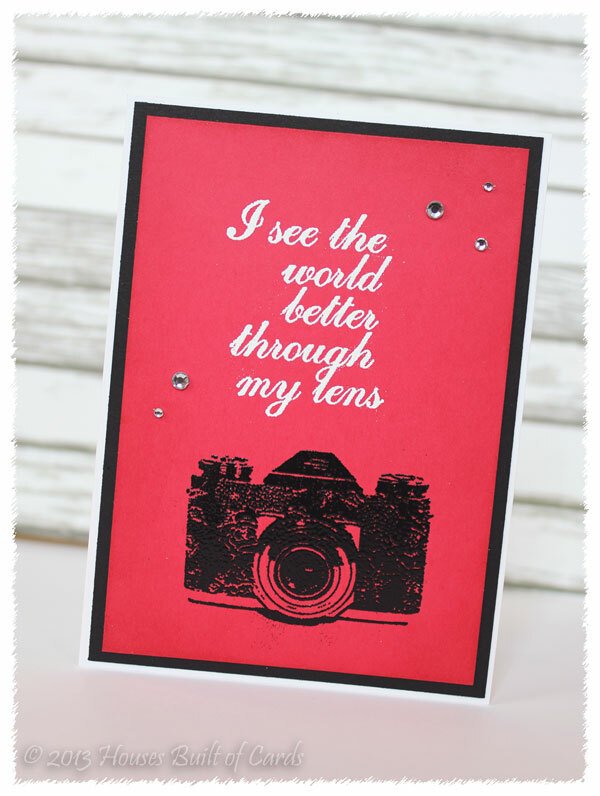 The typewriter with it's tiny sentiment is from the brand new February Kit of the Month. 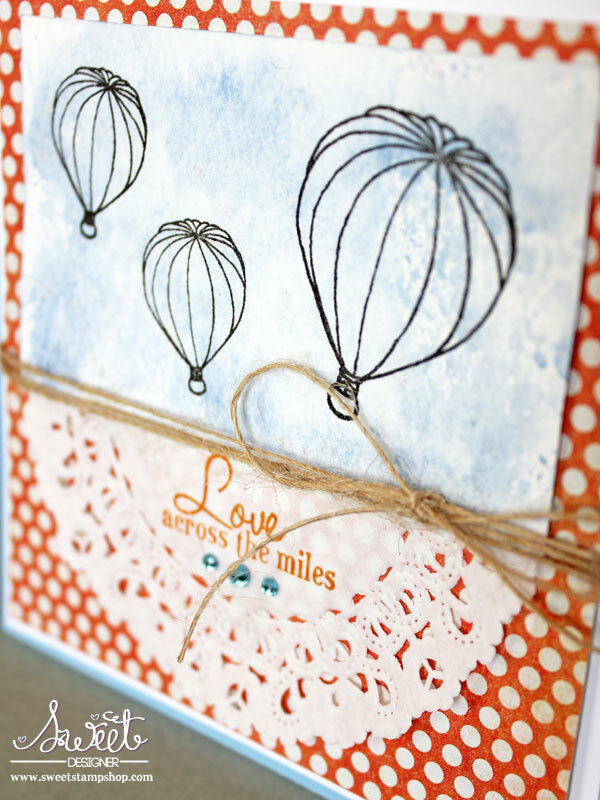 I stamped it on pattern paper, then fussy cut it out. 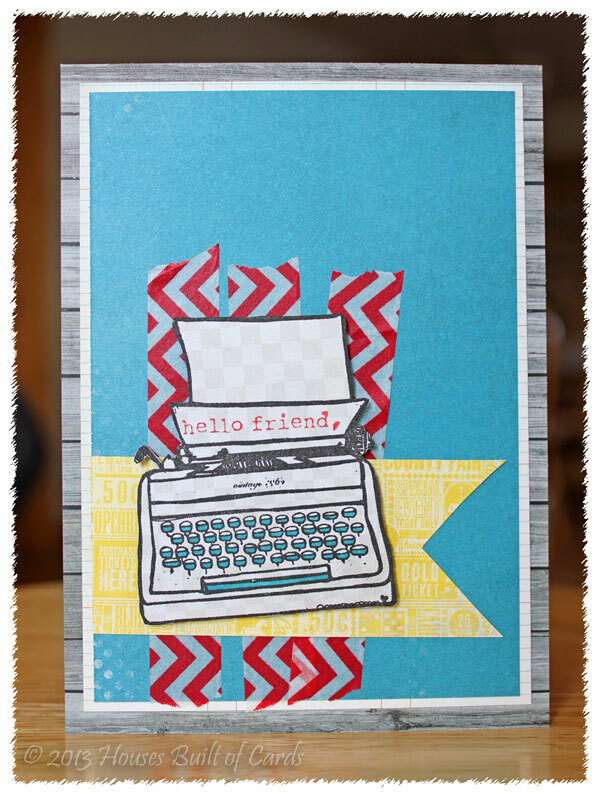 Added the sentiment using red distress ink, then colored in a few of the keys with my Copic markers. Finished off with a couple more layers of pattern paper. White on White - with a *tiny* bit of red! 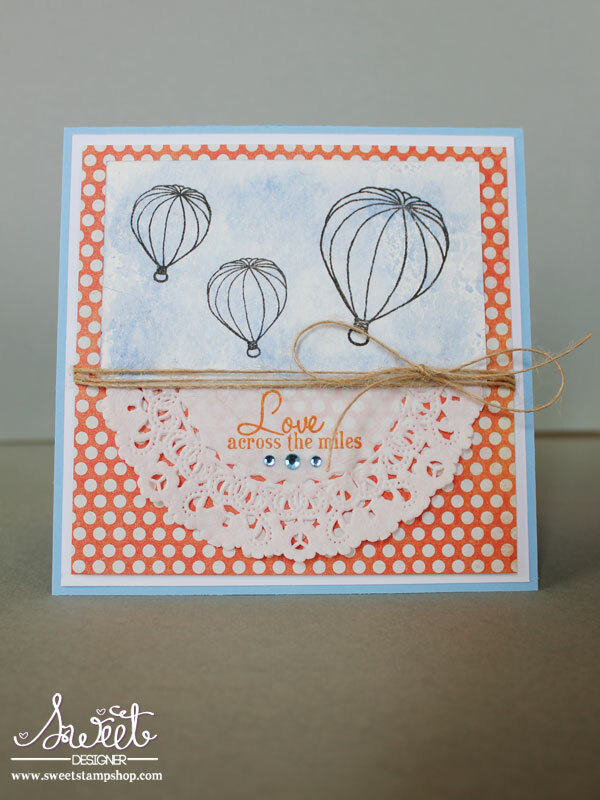 February SPS Hop and Challenge - Hearts!